Culvert Cleaning | The Culvert & Drainage Experts | Custom Crews Inc. The revolutionary cleaning method will restore flow to 100% even if the structure is completely clogged. By utilizing this process, CCI has the ability to clean all types and sizes of culverts and box structures that are obstructed by soil, silt, rocks, wood or other obstructions. The use of our directional drills offers many advantages including tool rotation, control of water injection/pressure as well as the ability to span any length of culvert simply by adding drill rods. With the awareness of environmental hazards detailed by federal and local regulations, it is important that drainage structures are properly maintained. In the past these structures have not been given the attention they deserve. 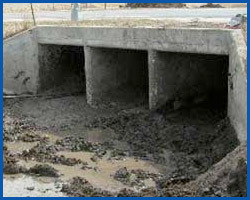 Many culverts in the U.S. have never been cleaned which has resulted in damages to the structures themselves, roads, ditches, personal property and even people. One of the main reasons organizations have not maintained their structures is due to the lack of efficient and effective culvert cleaning methods. Open cutting a road, jetter trucks, backhoes and cables are all methods that have been used to clean culverts in the past. All of these methods have fallen drastically short of our process. We are currently licensed for the HARR technology and New York, New Jersey. Ohio, West Virginia and some districts in Florida, Kentucky, Virginia & Connecticut. Our goal is to continue to provide the NYSDOT, NYS Thruway Authority, Counties, and Local Municipalities with an efficient and cost effective way to clean culverts in their respective jurisdictions. Please contact us to talk with our culvert manager about how we can best serve you. We are looking forward to introducing our company to you and working together to reduce the cost of maintaining your drainage systems.